What are the financial consequences of death on those left behind? And what kind of actions should one take beforehand to make it easier on them? 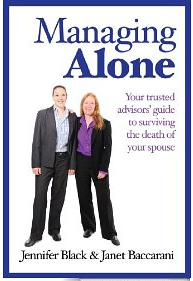 This book by two financial advisors who focus their practice on the widowed addresses such questions. The authors take a very informal approach. They present a series of vignettes, mini stories about situations, apparently taken from the experience of their practice, that give the book a very realistic feel. Each chapter is a story about what starts out as a happy couple ... but death awaits. I found myself thinking "who's gonna die this time?" as someone's slight cough inevitably turns fatal or a horrible accident stalks a hunting trip. It's easy and quick reading. Each vignette focuses on a few financial issues related to death - the last will and testament, life insurance, naming beneficiaries of accounts and policies, bank accounts in joint names, sharing knowledge between spouses of financial matters. Managing Alone serves as an introduction, an awareness-raising exercise, rather than a detailed how-to manual. The book makes the important point over and over that it is a lot easier on those still alive, especially considering the extreme emotional turmoil at the time of death of a loved one, to do things in advance. The repeated exhortation is to get professional advice, starting of course, since the authors are planners themselves, with a financial planner, who will bring in a lawyer or accountant as needed. This again highlights the importance of the current proposals to make financial advisors duty bound to put the interests of their clients first - people whose life is in major turmoil are probably more vulnerable and need to be able to rely on impartial advice that is totally and solely directed to their benefit. Though I am a committed DIY-er, it is likely most practical or wiser to involve a professional for certain actions e.g. when my personal situation was quite simple and straightforward I did not bother with a lawyer and wrote up my own holograph will but later on after my first wife had died, when I remarried and there were now two families involved, I used a lawyer to make sure the will accomplishes what I want. It is also true that not all professionals are equally competent and diligent, so one still needs to check their track record. Some characteristics of the book are awkward or frustrating. Each vignette throws in a list of financial data about the couple, most of which does not enter the discussion and is irrelevant to the chapter's topic. Why bother? Second, on some topics, the authors provide some detail but on several others as a reader I expected more, since the topics feature repeatedly in the book, but did not get it - e.g. who inherits what when a person dies without a valid will, or how to figure out how much life insurance one needs. The uneven amount of detail detracts from the book. There is much discussion of probate tax but little on minimizing investment taxes, the effects of deemed disposition on capital gains and such. Even references to more specialized books could have helped there. Bottom line: a brief easily-readable intro to many of the financial issues surrounding death. 3.5 out of 5 stars.